Stephanie Hirsch appropriates iconoclastic images and sayings and infuses them with the anarchistic spirit from whence they came. Through her use of beads, sequins and embroidery, Hirsch's canvases are literally 'illuminated' with words of enlightenment and hope. Her simple text and quips often cause the viewer to question their moral standings and beliefs, all the while offering aesthetically charged images that are simultaneously foreign and familiar. Hirsch states, "Mental and physical blockages in life are often self- inflicted, both literally and figuratively. I explore my journey through life as a quest to uncover the truth around me and to express my position through the multifaceted meanings inherent to the words we use and actions we do." 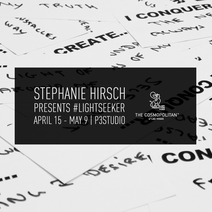 Stephanie Hirsch is currently the P3 Studio artist in residence through Art Production Fund at the Cosmopolitan of Las Vegas. Her residency runs from April 15-May 10.